"You will do foolish things, but do them with enthusiasm!" Colette. Our traditional Scrimshaw Graceful Ladies' Ring in Embossed Sterling Silver is modeled after a Turn-of-the-Century Scrimshaw ring. It is a wonderful heirloom piece that will never go out of style. Choose your scrimshaw design from either a nautical theme or flowers, and have it etched on any of our ivory types, as shown below. As added options have us hand etch your very own boat, power or sail, on one of our rings. 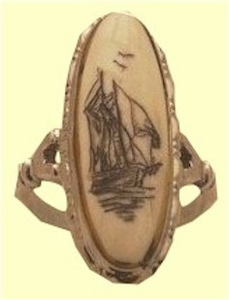 Shown with Gloucester schooner on Light Mammoth Ivory. Of course, completely handcrafted here in our studio.